Home / Blog / What is a data logger? Posted On: 4th December 2018 . Comark have a range of data loggers; compact, electronic instruments that record measurements at set intervals over a fixed or unlimited period. Depending on your requirement, data loggers range from models that can be downloaded after a single trip or more sophisticated wireless devices that can be left in place continuously. Your application will dictate which model you choose as the requirements for measuring a consignment in transport is very different to the continuous monitoring of storage areas in food and healthcare applications. A data logger may be a single unit, stand-alone device with internal sensors that can be downloaded manually, through to high-tech, wireless instruments with internal plus one or more external sensors. The basic explanation is that a data logger is a device with a sensor to measure something and a computer chip to store it prior to downloading the data. What can I measure with a data logger? Comark specialise in the measurement of temperature and humidity in food and healthcare applications and most of the data logger range has been developed with this in mind. However, we have recognised the need in some industrial processes to measure other parameters. In the range there are also data loggers suited to specialist sensors to measure AC/DC current and voltage, light intensity (lux), carbon dioxide levels, dissolved oxygen etc. Why use a data logger? Data loggers provide a low-cost means to record measurements via internal and external sensors. Their stand-alone operation provides the ideal means to capture data, removing the need to have staff spend time manually taking and recording measurements themselves. In today’s heavily regulated environments, data loggers improve accuracy as date and time stamped data is stored automatically. This automation avoids data loss or costly errors through forgotten readings or mis-recorded results. Many of these regulatory bodies require reports that can be easily downloaded in graphical and tabular formats in Excel or as a PDF document. It is much easier to assimilate data that has been recorded electronically in a standard format. In sensitive environments, alarm notifications can make all the difference between saving and losing products. Alarms are triggered for any out-of-range temperature or humidity readings so quick corrective action can be taken. Imagine leaving a refrigerator or freezer door open for many hours. The inside temperature would rise to unsafe levels and costly product would be lost. With data loggers monitoring the temperature, an alarm would be triggered so staff are alerted quickly so they can remedy the situation. What’s the frequency of monitoring I require? If you want to measure consignments of goods in transit a simple data logger with an internal sensor may suffice. This type of device is downloaded when the trip is complete. High risk environments that require automated round-the-clock would be more suited to wireless data loggers. What is the memory capacity of the device? If you choose a data logger that requires manual downloading, it is a good idea to check the memory capacity of the device. This is usually listed in the technical specification for the product. For wireless data loggers that continually download data this is less of a problem but there should be sufficient memory capacity to cover events such as a power outage. What software do I need? Comark software supplied with our data loggers is free of charge. It is important to check as other companies do charge for associated software. The software should provide all the features required for regulatory compliance. Pharmaceutical and healthcare applications that adhere to 21CFR Part 11 or food industry applications meeting the latest food safety regulations will require suitable reporting, audit trails and time-stamped data. What type of data storage? With Comark data loggers you can choose whether data is hosted locally on your computer, hosted via a locally sited Gateway or hosted in the Cloud. If you manage a multi-site operation, then Cloud or Gateway hosted data may be the best solution for you as data can be accessed from any internet enabled device. If you need to check your system when off-site, a quick glance at your phone or tablet will tell you all you need to know. For simpler projects, hosting data locally on your computer may be sufficient. What about after sales support? Comark offers a full calibration service to ensure your data loggers continue to operate as accurately as possible. Annual calibration is a requirement of many compliance programs. In some geographic locations, Comark has a dedicated on-site service team that can carry out annual calibration of fixed data logging systems at your premises. Where this service does not operate, you can send your instruments to our dedicated laboratories for re-calibration. Should you have any operational questions regarding Comark data loggers or associated software, our technical team have in-depth product knowledge and many years’ experience between them. Comark EVt2 Data Logger – a simple, easy to operate data logger with internal sensor. Use with Comark EV Software. 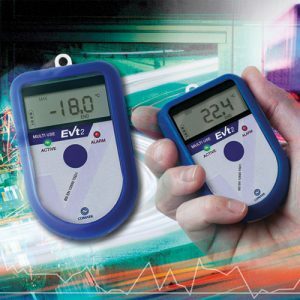 Diligence EV N2000 Data Loggers – robust data loggers with LCD screen and alarm LEDs. Manual download of data. Range includes models with internal sensor through to devices with external multi-channel sensors. Use with Comark EV Software. Diligence WiFi RF300 Data Loggers – WiFi enabled data loggers with LCD screen. Automated data collection with both computer based and cloud data storage available. Range includes models with internal sensor through to devices with external multi-channel sensors. Use with Comark’s Diligence WiFi Software. Comark RF500 Wireless Monitoring – The best solution for high accuracy applications where compliance to 21CFR Part 11 or stringent food safety regulations is a must. A self-healing wireless network of data loggers. Automated data collection with both computer based and cloud data storage available. Range includes models with internal sensor through to devices with external multi-channel sensors. Use with Comark’s RF500 Software. Data is hosted on site via the RF500 Gateway. View the RF500 page to view the live demo and see the system in action.